Babylon a dictionary that allows you to translate words from one language to another. Working with the dictionary is very simple after clicking on the word of interest, a window appears with its translation. In addition to translating words, the program includes English themed and explanatory dictionaries, and also has the functions of currency conversion at the current date and the transfer of measures from one system to another. English-Urdu-Hindi and other dictionaries can be downloaded additionally from the developer’s site. In addition to the dictionary, which can be used at any time, with online work, Babylon allows you to take advantage of huge databases, concentrated in such glossaries as Britannica, Amazon, Accuweather and others. 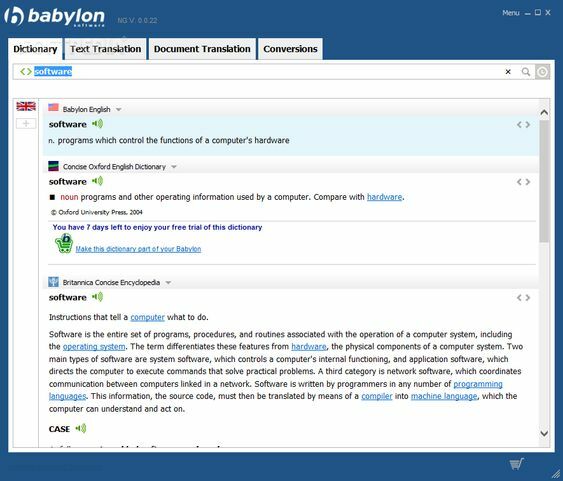 Dictionaries and applications Babylon is more than 1400 sources of values ​​in 75 languages. The built-in database includes 25 professional dictionaries created in the company’s own linguistic laboratory in 17 languages: English, French, German, Spanish, Italian, Portuguese, Japanese, Hebrew, Chinese traditional, Chinese simplified, Russian, Dutch, Korean, Swedish, Greek , Arabic and Turkish. In addition, customers can purchase additional dictionaries and reference books of such series as Oxford University Press, Britannica, Merriam-Webster, Vox, Langenscheidt, Pons, Van Dale, Melhoramentos and Taishukan. • Simple work – translations of texts, words, search for values, currency conversion, time zones and change units are performed in one click. • Constant availability – the system integrates with any application, both desktop and web-services.